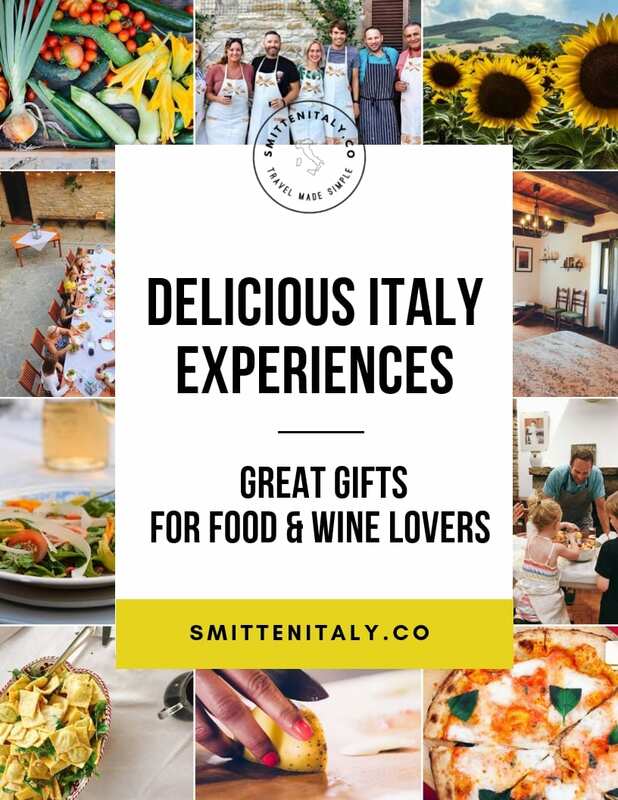 8 Delicious Italy Experiences to Give (or Receive) as Gifts - Smitten Italy + Co. The gift of delicious Italy experiences. The best gifts of all are memories, not things. Have you heard this before? I’m pretty sure my 8 year old self would disagree, but now more than ever I find myself longing to accumulate more memories than stuff. When you give the gift of an experience, you empower learning, exploring & memory making instead of adding to our already cluttered lives. Lately when my family and I travel, we make a priority of doing a special activity together in place of buying souvenirs that will just take up space at home- and luckily the older my kids have gotten, the more in tune with this idea they have become. 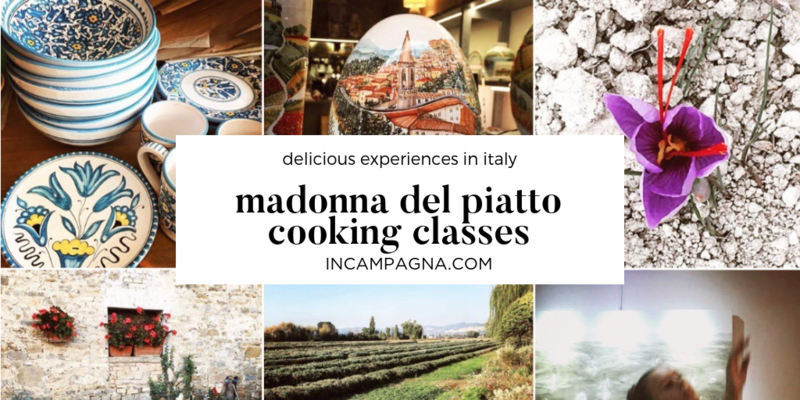 Just in time for the holidays, I’ve gathered together my favorite people offering delicious activities in Italy. (I think my kindred spirit food and wine lovers will especially love these ideas.) This isn’t a sponsored post or filled with affiliate links, these are my top picks based on personal connections and experiences that I truly love and want to share with you. 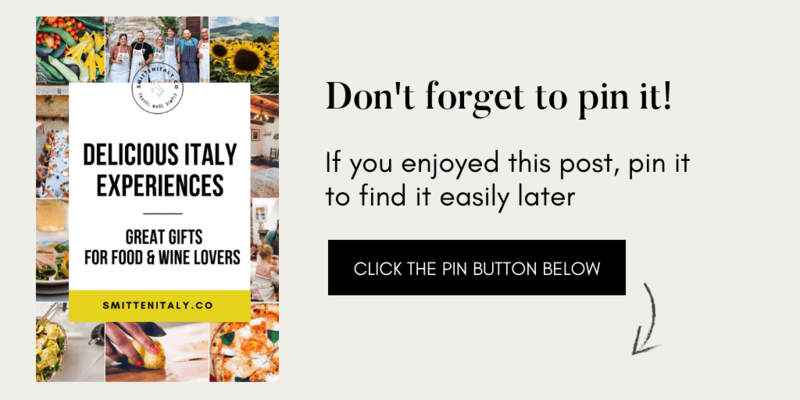 If you or someone you love is headed to Italy in the near future, I hope you’ll keep this list of delicious Italy experiences handy to help with your planning! 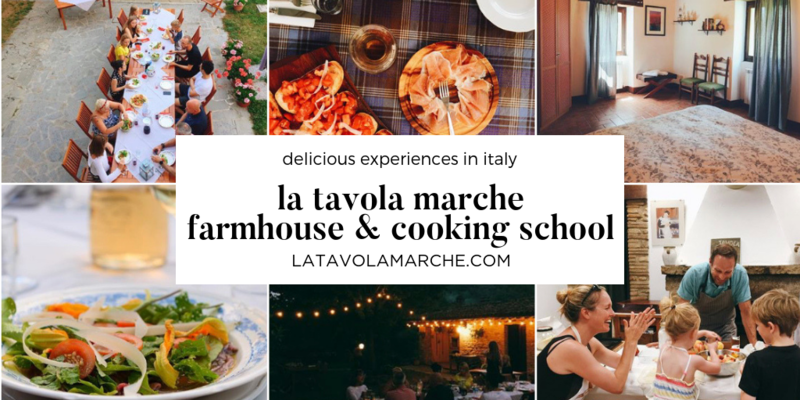 A stay at La Tavola Marche farmhouse & cooking school is the perfect gift for a romantic getaway or a family escape. Enjoy a taste of Italian country living, and stay in one of Ashley & Jason’s adorable farmhouse apartments while exploring the hills, villages & seaside of Le Marche. Don’t miss taking a hands-on cooking class from Jason, a classically trained chef, and check out their special events, like the “Made in Le Marche” tour or Moving to Italy workshops. You can also rent the entire farmhouse for your family or friends group, and enjoy a private pool, delicious meals made by Chef Jason and more. Jason & Ashley will arrange food tours, wine tastings, local activities or other things of interest to you and help make this an event to remember. *Gift Certificates are available! Contact Ashley for more info. 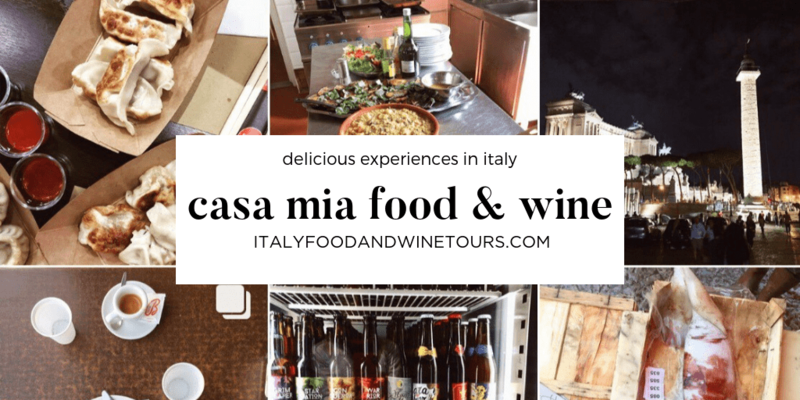 Casa Mia founders Eleonora & Gina are the ladies to know if you want to learn about and taste some seriously good food and wine while you are in Italy. They offer private tours in Naples, Rome & beyond and they specialize in all things delicious. Think market tours, cooking classes, pizza making, vineyard tours & picnics, wine tastings & education and more. It will be a gift to remember if you make plans to spend some time with Casa Mia on your next Italy adventure! *Gift Certificates available! Contact Gina or Eleonora for details. 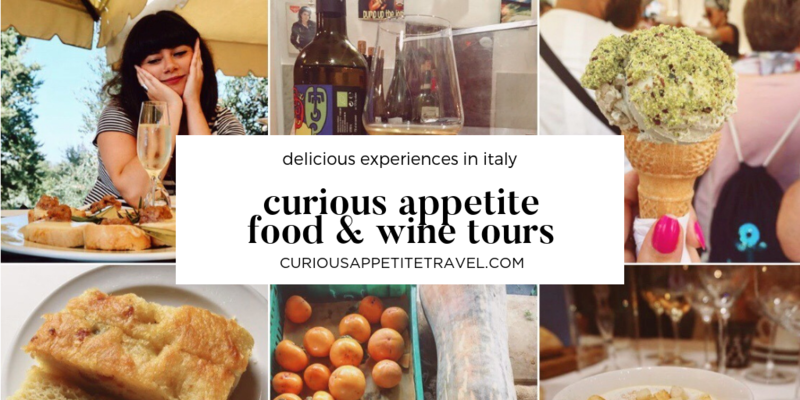 Florence based food and wine expert Coral Sisk of Curious Appetite Travel is the gal to know if you are headed to Tuscany or Bologna. She offers gourmet tours including some interesting immersive tours like a progressive dinner crawl, (love this idea!) or an aperitivo tour complete with craft cocktails paired with gourmet small bites. Another great gift idea is her Florentine Gourmet Club (on my wish list) and Negroni Club. Both are 1 time order gift boxes filled with items straight from independent local makers & artisans. In other words, really great locally sourced delicious products expertly curated by Coral that you can’t find anywhere else! *Gift Certificates available! More details can be found here. Letizia Mattiacci is the owner and cook behind Madonna del Piatto cooking school, a place very near and dear to my heart. Letizia offers half day cooking classes with a 4 course lunch, and has a beautiful B&B and holiday apartment you can rent as well. I adore Letizia and her in-depth, no-nonsense teaching style- and always come away with so many tips & skills to try at home. Your holiday will be extra special with a day (or days!) spent with Letizia on her magical mountain near Assisi. It is a great home-base for exploring the area with Assisi practically at your doorstep, and the stunning towns of Perugia, Bevagna, Spello, Trevi and Montefalco all within a short drive. *I love it so much that I return each year to help her with a tour for the Olive Harvest in autumn. Our 4 night tour would be an amazing surprise for someone you love! Contact me if you want more info or want help planning your own trip. 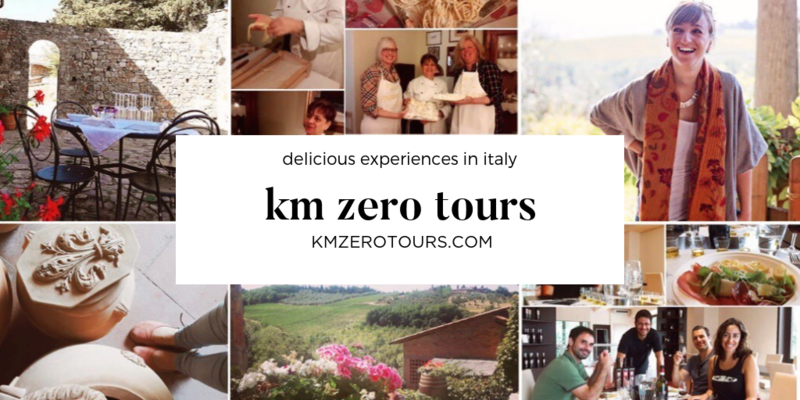 KM Zero Tours is based just outside of Florence, the perfect launching point to explore Tuscany. Arianna & Alessio will share their passion for Tuscany’s food, wine & artisan makers with you, whether you book a day-trip from Florence or a multi-day tour with them. Some of the experiences they offer: Visiting a silver workshop, tours & tastes at historical wineries, learning about ancient grains and a bakery demonstration, tasting fresh cheese & new olive oil, visiting a cashmere goat farm and so much more! I absolutely love their approach to sharing the treasures of Tuscany- and how they make sure each activity is carefully created to give you a unique & unforgettable experience. I recommend spending several days with them if you can, to enjoy the whole KM Zero experience and take advantage of their exclusive activities & contacts. 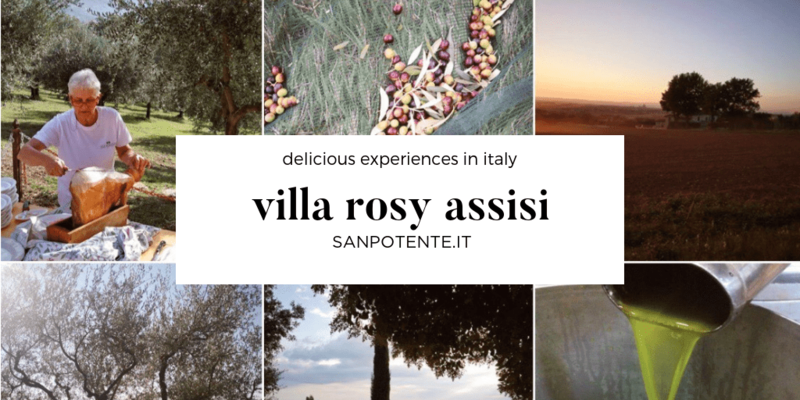 Corinna Tonti and her family are the hosts of Villa Rosy, their holiday villa rental in the middle of a stunning olive grove in the hills near Assisi. You can rent the entire villa, or just part of it depending on the size of your group and your needs. Villa Rosy is a relaxed and beautiful spot to spend your holidays and situated off a quiet road, but has easy access to the autostrada when you want to explore the area, if you can rip yourself away from the peaceful garden & olive grove. The family also offers Residence Menotre, consisting of 3 adorable apartments built into a 15th century tower in the mountain hamlet of Rasiglia. This gorgeous & unique place to visit ia a true getaway for anyone who loves nature and the idea of staying in a small village. I dream of taking my husband there someday, it’s the perfect romantic escape! The Beehive is well known as a wonderful hostel & café in the heart of Rome, owned and run by Steve Brenner and Linda Martinez. 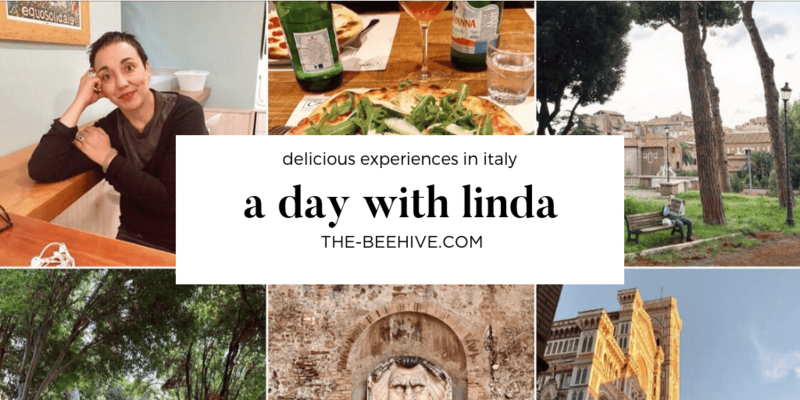 What you might not know is that you can now book a day out with Linda– your personal navigator in Rome. I think this is a wonderful offering for anyone whether you are new to Rome, or looking to go deeper on your next visit. Linda has called Rome home for nearly 20 years and is a wealth of knowledge for off the beaten path info & places. While Linda’s navigator services aren’t specifically food based, you can customize your time with her to include just about anything you are passionate about- whether your interests are gelato, coffee, crafting, vintage shopping etc. My dream day? Having Linda take me on a vintage shop/market hunting crawl dotted with coffee breaks, followed by a Thursday evening pasta making class with her husband Steve back at The Beehive. Think about how lovely it will be to roll directly to your cozy room after that delicious pasta making class! Latteria Studio is honestly a dream come true. 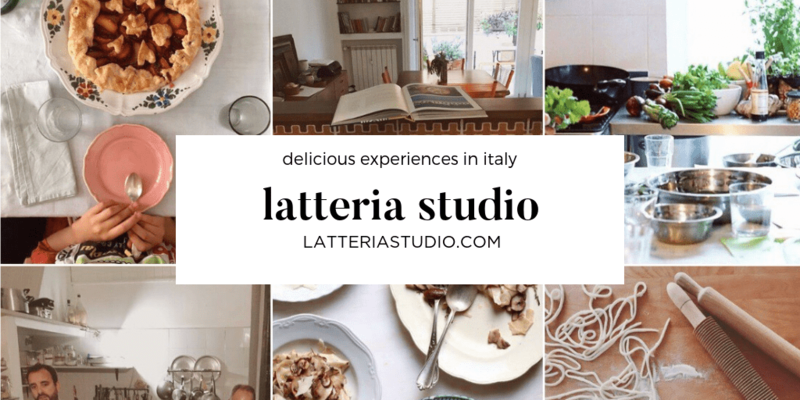 This beautiful, sunny food photography & multi-use kitchen space is in Trastevere- in the heart of Rome. The popular Market to Table classes with Alice Adams, Carla Tomasi & Rachel Roddy are held here monthly, as well as other rotating lovely food centric events. I highly recommend the Market to Table experience. After several years of wishing- I finally made it this year, and was thrilled to spend the day with cooks Alice Adams and Carla Tomasi- a power duo that I’ve come to adore. It was definitely the highlight of my Roman adventures this year. 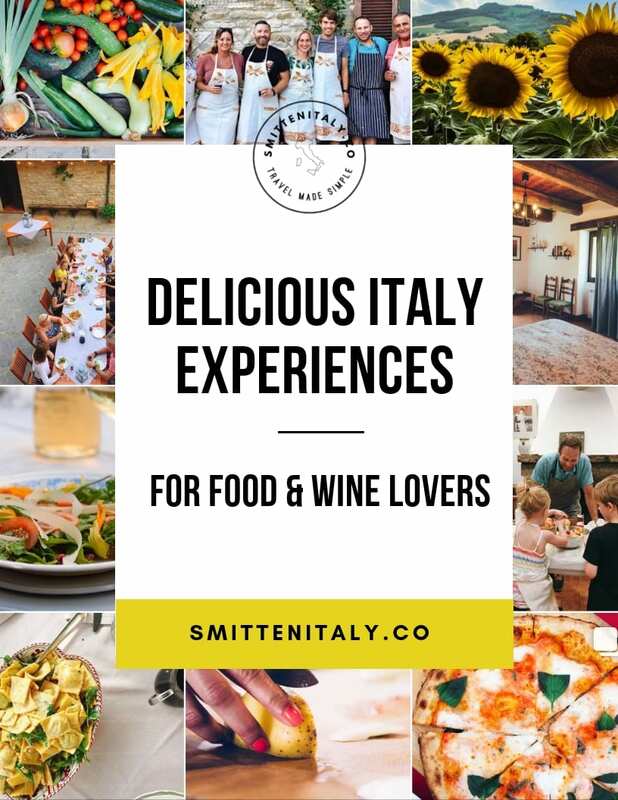 Consider them when you are planning a special trip to Rome, this is surely an unforgettable experience for foodies & cooks. Whether you are looking for a fun & delicious Italy experience for yourself or someone you love, you can’t miss with any of these options. Bonus: you’ll also be supporting small businesses at the same time, which I love! >> Check out our other gift ideas for Italy Lovers here. Head Italy nerd, cheese enthusiast & recovering expat. I create travel tools & resources to help you plan a delicious Italy adventure. Build your perfect trip with our Italy Inspiration and advice.